Another Beautiful Sunday in Paradise. It really was a nice day in the 70's but we did have about a 10 mph SE breeze. You could almost fly going West on the Causeway but had to work some coming back going East. There was a pretty good size group of people. I counted about 36 in the group picture and several more missed the group picture. 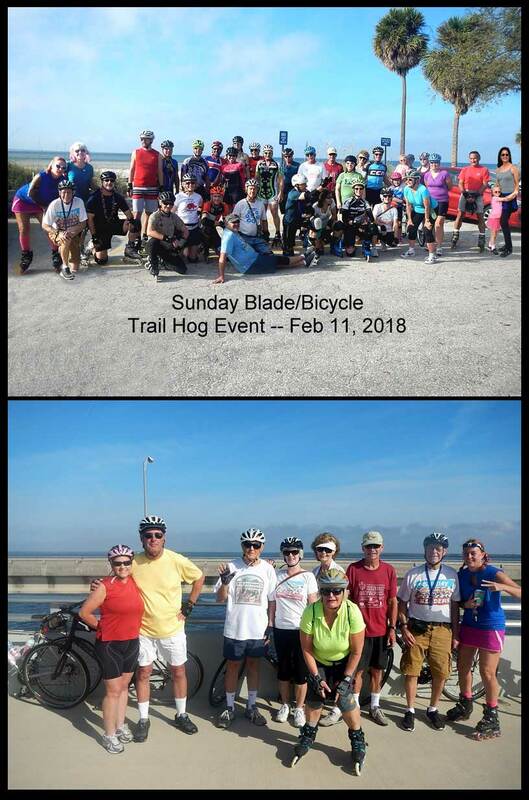 Thanks Jessica for inviting the Sunday Bladers/Bicyclers to your Trail Hog event. The distance from the East Parking Lot to the Causeway West end at the Bayshore Blvd traffic light was close to 8 miles. Several made the 16 mile round trip. However several just did a 10 or 12 mile round trip. The Sunday Bladers/Bicyclers planned to Brunch at the Athens Restaurant in Safety Harbor. However when we got to Safety Harbor there were no parking places anywhere. Oh well, there will be many more Sunday Brunches.